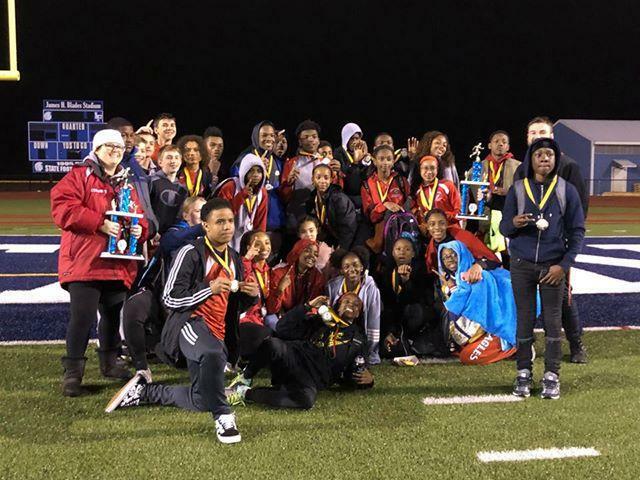 Smyrna Middle school Boys & Girls Track & Field teams accomplished something that hasn't been done in 16 years competing in the Jim Blades Track & Field Invitational held at Lake Forest in Felton Delaware. Both teams won the Southern Delaware Middle School Championship or known as Jim Blades Invitational in their respective divisions. The girls team won in convincing fashion with a totaled score of 148.33 with the 2nd place team coming in at 91.33 which was Beacon Track & Field. Smyrna leaders were Kailah Crews 1st place & Desiree Zappata taking 2nd place in the 100m Dash, Amira Allen 1st place & Epiphany Riachards taking 2nd place in the 200m Dash, Mya Adams took 2nd place in the 1600 m Run, Kailah Crews 1st place & Elise Carter taking 2nd place in the 55m hurdles, Yazmina Gall 1st place in the Triple Jump, & Girls Roarie Glenn-Russum 2nd place in Shot Put. Smyrna girls dominated the relays by taking 1st place in the 4x100 Relay with the team of Kailah Crews, Epiphany Richards, Laila Rowland, Desiree Zappata & 1st place in the 4x200 Relay with the team of Wilson, Amira Allen, Laila Rowland, Desiree Zappata. The Smyrna boy track & field team had a really good meet as well taking 1st place with a total score of 107.50. Their 1st place winners for them was Bahsil Laster who tied for first in the Boys High Jump, Ivan Stanley in the Long Jump, & their 4X200 Realy team of Denim Smith, Bahsil Laster, William Slour, and Yamir Knight. Their 2nd place finishes are Marcus McClenton in the 800m Run & 1600m Run, and the 4x100 Realy team of Ivan Stanley, Bahsil Laster, William Slour, and Yamir Knight.